Stop-Motion animation was very popular as an early form of animation, as seen in King Kong and 'The Mascot', which I posted about earlier in the week. 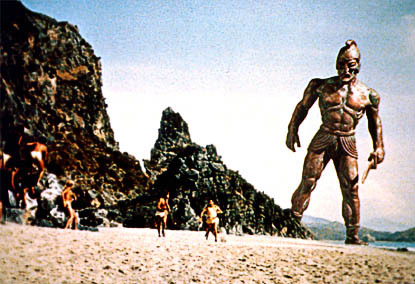 The next major film to use stop-motion and is acclaimed as a classic of the genre is 'Jason and the Argonauts'. The animation effects for this film were created by the Visual Effects Supervisor - Ray Harryhausen. Harryhausen was inspired by the production of King Kong and began to work on stop-motion by creating a series of short films, he was soon hired by Paramount. He went on to create the effects for several films, but his 'masterpiece' was considered to be 'Jason and the Argonauts'. Jason and the Argonauts follows the Greek myth of a hero in search for the Golden Fleece of a ram in the land of Colchis to regain the Kingdom that was taken from his Father. It is an ancient Greek myth from the time of Homer and there are many similarites between the story and Homer's Illiad and Odyssey, both literary classics. The stop-motion animation used in the film is ground-breaking for the time it was released. The most notable scene is the finale, where Jason and two of his 'Argonauts', fight a group of undead skeletons who were the victims of the 'Hydra', who Jason had slain. Although quite rough and easy to see the production of, this scene is quite convincing and very innovative for 1960. The scenes involving the stop-motion were filmed with the actors fighting the air, with the creatures added in afterwards, which explains why there seems to be no 'hard-hitting' collisions or sword-hits. This film was very enjoyable, as the story was a classic and the pacing was very well suited. I'd seen the film several times before, along with Harryhausen's next masterpiece ' The Clash of the Titans', but I'd never really looked in a detailed sense at the stop-motion, I was too engrossed with the story. I remember watching that skeleton fight scene as a kid thinking, "thats so cool!" and "How did they do that?"